The Federal Motor Carrier Safety Administration (FMCSA) published a press release that outlined an update to the Electronic Logging Device (ELD) rule. 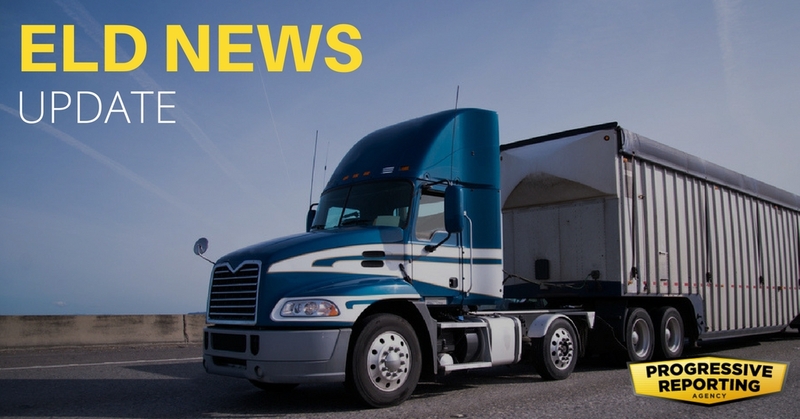 Here are the highlights of that press release and how it could affect your trucking company. Starting April 1, 2018, any driver that is not compliant with the ELD rule and is subject to Federal Motor Carrier Safety Regulations (FMCSRs) will be placed out-of-service. Any driver under your company that does not have an ELD will be forced to remain out of service for 10 hours. Drivers will be allowed to drop off their load before getting an ELD, but they can’t be dispatched again until they install an ELD that meets FMCSA’s guidelines. The FMCSA is also granting an additional 90-day temporary waiver from the ELD rule for those hauling goods in the agriculture industry. Further laws and rules will be published later to better accommodate those who haul for the agriculture industry. If you have any questions about following FMCSA’s regulations or the ELD rule, don’t hesitate to give the coaches at Progressive Reporting a call at (866) 574-2978! Who Needs to Be Compliant Under the ELD Rule? If you’re new to the trucking industry or haven’t heard about the ELD rule, here’s what you need to know. The ELD rule requires certain carriers to use an ELD instead of alternative tracking methods, like paper logs. You need an ELD in your truck if you’re a motor carrier and driver who has to maintain records of duty status (RODS). However, there are a few exceptions to the rule. You only use paper logs no more than 8 days during any 30-day period. You haul another vehicle as a driveaway-towaway driver or you’re transporting a motor home or RV with one or more sets of wheels that sit on the roadway. Your vehicle was manufactured before model year 2000. What Happens If You Aren’t Compliant? If you are a carrier subject to the FMCSRs, your driver could be put out of service for not following the ELD rule. Commercial drivers who are required to prepare hours-of-service records of duty status must have an ELD. The ELD used must meet FMCSA requirements. The rule prohibits the harassment of drivers based on the data logged by the ELD. It also provides actions drivers can take if they think they have been harassed based on ELD data. In order to be compliant with the ELD rule, you must follow the regulations set by the FMCSA and retain supporting documents that are also required. The FMCSA offers this guide on the ELD rule that outlines which ELDs meet the FMCSA’s guidelines and how to stay compliant. You can also give the coaches at Progressive Reporting a call. We know how to navigate the regulations set by the FMCSA, so you don’t have to waste time and money sorting through paperwork or worrying that your company will be put out-of-service for not following the ELD rule.